Nominations for the 2010 Louisiana Farmer of the Year are being accepted now through Dec. 11, 2009. Application forms can be obtained at any parish LSU AgCenter Extension Service office or online at www.lsuagcenter.com/farmeroftheyear. Producers from all areas of agriculture are eligible to enter. Three finalists will be recognized at White Oak Plantation in Baton Rouge on Feb. 26, 2010, with the winner receiving a cash award and other prizes. BATON ROUGE— Scientists and professionals who are working on the frontlines of biosecurity research will gather at Southern University on November 10-12, 2009, to uncover potential threats to our nation’s natural resources and agriculture. They will participate in the university’s third annual Frontline Biosecurity Symposium. This symposium features presentations and demonstrations from researchers at universities and federal and state agencies who are monitoring high consequence plant pathogens, insect pests, and invasive weeds that threaten our nation’s agriculture and renewable natural resources, says Daniel Collins, professor of plant pathology and symposium organizer. Participating in the symposium are representatives from the Federal Bureau of Investigation, USDA ARS and APHS offices, Louisiana Department of Agriculture and Forestry - Horticulture and Quarantine Programs, US Customs and Border Protection, Department of Homeland Security, and Howard, Louisiana State University, Oklahoma State, and Pennsylvania State universities. Disruption of US agriculture by the unintentional or intentional release of high risk plant pathogens would be catastrophic to the US/global economies and stability. Preparedness is a critical strategy in defending the nation against intentional or unintentional release of exotic plant pathogens that pose a threat to plants (crops) important to our nation’s agriculture. Many reports have addressed the need to provide more post baccalaureate training, and experiential learning in plant health management at the U.S. land-grant universities to counter the threat of high-risk plant pathogens to our nation’s agriculture. Southern University and A&M College and other land-grant institutions are key components in training the next generation of scientists and professionals in plant health management to protect our nation’s domestic food supply, and renewable natural resources. The Plant Biosecurity Symposium is sponsored by a grant awarded to Collins by the U. S. Department of Agriculture, National Institute of Food and Agriculture 1890 Teaching Capacity Building Grants Program for enhancement of the M.S. and Ph.D. degree programs in urban forestry at Southern University through plant biosecurity training. New technology that can depict structural defects in trees is available now at the Southern University Urban Forestry Program to assist homeowners in tree diagnosis. Known as Tree Resistograph, the instrument measures wood resistance and can identify where decay, cracks and hollowness exist within tree trunks. the structural soundness of two large water oak trees (3ft in diameter) in his backyard. Yadong Qi, Ph.D., professor of urban forestry, and Yongsheng Li, doctoral student, surveyed the site and tested the trees using the Resistograph. lighten up the crowns above. The homeowner received the good news with a smile. “The tree survey using the Tree Resistograph technology enhances our ability to help home owners in making informed decisions about their trees,” said Williams. conduct research, education and outreach in urban forestry,” said Qi. The Picus Sonic Tomography is another technology that can detect the soundness and structural defects of tree trunks. Both instruments were funded by the SU HBGI program. For more information, contact Qi at yadong_qi@suagcenter.com. The principal and teachers of St. Helena Central Middle School collaborated with Angela Myles, area youth agent, to establish a junior master garden club. Today, mustard greens are sprouting in the garden which doubles as a community garden. The garden is used to nurture community spirit, common purpose and culture appreciation among the diverse populations in the parish. The children involved in the school-based 4-H Club, along with their parents, said the vibrant garden would be an environmental classroom for tangible educational projects, service learning and leadership development. Several community leaders and local businesses are excited about volunteering in the garden project as a way of giving back to the community. The mission of the community garden is to bring school children and community members together to work for a sustainable planet. The project is designed to motivate and equip St. Helena residents to take action on behalf of youth at the community, organizational, family and individual levels. As an outside classroom, the vegetable garden provides real life, hands-on experience to study health and nutrition, oral health, science, mathematics, ecology, agriculture and more. The concept builds upon the existing community resources and assets; it has the power to change peoples’ lives and can affect St. Helena children in profound ways," said Myles. Gina E. Eubanks, Ph.D., vice chancellor for extension, recently participated in a panel discussion addressing “Some Marketing Ideas” along side Linda Fox, Washington State University, Dennis Calvin, The Pennsylvania State University, and Paul Coreil, LSU AgCenter. The panel was part of Managing in Tough Times National Extension Initiative webinar, sponsored by Extension Committee on Organization and Policy Program Subcommittee on September 15. Bossier Parish parent educator Katherine Ervin has been busy teaching residents from varied background, age groups, education and culture how to quilt. They gathered at the Martin Luther King Center for some educational sessions. The sessions began with the group being reminded that challenges and problems in life have a purpose and a lesson. Cocaine, crack and marijuana pose a major illicit drug problem in Bossier Parish. Women with children make up half the number of people admitted for drug abuse treatment. These negative behaviors are key indicators of the need for the Southern University Ag Center’s Full Circle Parenting classes which help individuals “piece it together,” said Ervin. In September, three educational sessions were conducted including self-esteem, anger management, family values and simple scrap quilting to empower these parents to take control of their family situations. An overwhelming number of today’s parents and grandparents believe it is more difficult to raise a family now than it was a generation ago. All parents want their children to succeed. But knowing how to help them make smart choices and avoid pitfalls is not easy. These parenting sessions equip parents and guardians to strengthen relationships with children and other family members, improve communication, and manage family stress. After a few sessions, participants said they would apply the new techniques to parenting and share with family members. During the Scrap Quilting classes, participants enjoyed choosing colors, cutting, and laying out the pieces for their scrap quilt tops. Piecing the patterns together brought smiles to many faces. 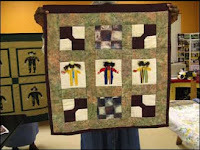 “The lesson learned was that hard work pays off like the beautiful quilt as the finished product,” said Ervin. The Center for Rural and Small Business Development at Southern University Ag Center has been awarded a $100,000 economic development and business promotion grant by the United States Department of Agriculture. training and benefits to rural youth," said USDA secretary Tom Vilsack. "President Obama believes our nation's economic competitiveness and the path to the American dream depend on providing every student with an education that will enable them to succeed in a global economy. Using these funds, students will learn to take advantage of existing economic development opportunities in their communities - such as renewable energy resources - as well as the vast business knowledge and connections that these schools and their faculty members have." Thursday, October 8, will be a very important day for USDA science, with the formal launch of the National Institute of Food and Agriculture . USDA Secretary Tom Vilsack intends to deliver a major address on the future of USDA science at the National Press Club. The event – including the Secretary’s remarks – will be webcast live at www.Visualwebcaster.com/NIFA-Rollout beginning at 2 p.m. Eastern Daylight Time. NIFA replaces USDA's Cooperative State Research, Education, and Extension Services. Like CSREES, NIFA focuses on investing in science and solving critical issues impacting people's daily lives and the nation's future. For more information, visit www.nifa.usda.gov. CSREES continues to fund programs at the Southern University Ag Center throughout the state.